Wind power is a small, but fast-growing segment of the U.S. energy market. Right now, energy companies are scouring rural America for the best spots to put up wind turbines, but wind is not enough – these companies need land, too. The Great Lakes Radio Consortium’s Shawn Allee looks at one wind developer’s search for its next wind farm. The search for wind power could turn into a modern-day gold rush. Wind’s becoming a profitable way to meet growing demand for clean energy, but wind power companies face an obstacle: they can’t just find a windy spot and throw up some wind turbines. They’ve got to sign a contract with a landowner, usually a farmer, who’s willing to rent out some breezy land. Mike Donahue is Vice President of Midwest Wind Power. His main job: find windy land and the farmers who own it. Donahue says the job’s changed recently. For their part, savvy farmers aren’t waiting around for companies to call them. They’re taking the initiative. David Coffey farms hundreds of acres in Illinois. A few months back, he did a little investigating. So Coffey got equipment from a university and tested the wind along his ridge. The initial results were promising, and the university posted the data online. Donahue’s company noticed the results, and gave David Coffey a call. Which leads us to today. Coffey’s agreed to give the company a tour of the area. After some quick introductions, Donahue, his partner Tim Polz, and I, squeeze into Coffey’s white pickup. Coffey drives us along a maze of gravel-lined back roads and soy bean fields. Soon, we see the ridge that brought Donahue’s company here. It’s not that spectacular, really. It’s just a big, rolling hill, but it spreads to the horizon. Midwest Wind Power wants a large site like this, because it’s hard to turn a profit on smaller ones. Several farmers own bits of this ridge, so Donahue might have to deal with all of them, and that could be a headache. Of course, maybe other companies noticed David Coffey’s wind data, too. Donahue’s assistant, Tim Polz, broaches the subject. Coffey says yes, but doesn’t elaborate. Donahue makes his pitch. He says his company offers more than good rent, it offers other benefits attractive to farmers. Even with this flexibility, though, money counts. 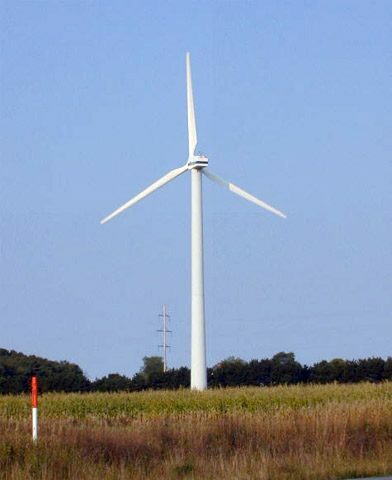 The company will pay farmers about seven thousand dollars each year for every turbine on their property. That’s a lot for an Illinois farmer. On average, they make only thirty thousand dollars in farm income each year. Soon the conversation shifts away from money. Donahue asks whether Coffey’s neighbors are mostly farmers. Coffey assures him nearly everyone’s a farmer out here. And with that, he ends the tour. It’s not clear what will come of today’s meeting. Maybe another company will land a contract, or perhaps there’ll never be turbines here, but the chances for success improve with each encounter. Previous PostPrevious A Safer Stain-Resistant Chemical?